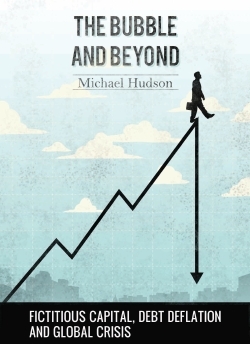 Michael Hudson’s new book The Bubble & Beyond is vital for those vying to make sense of the economic quicksand global policy makers find themselves in. Buy it now in print or in digital on Kindle. He ties a thread between the big issues of our times – underwater housing, money market manipulations and lifetime debt – concerns that appear too difficult for the world’s big name economists. Hudson does this by looking at the systemic causes of inequality, complexity and economic despair. The book traces how industrial capitalism has turned into finance capitalism. The finance, insurance and real estate (FIRE) sector has emerged to create “balance sheet wealth” not by new tangible investment and employment, but financially in the form of debt leveraging and rent-extraction. Decision making is clouded by an economic system that favors natural monopolies. Michael’s reading of policy implications for the geo-political future is compelling. Hudson has peppered the online community with cutting commentary of contemporary issues over recent years. This is his first full book in over 20 years. For students of the big picture, The Bubble and Beyond provides a compelling road map into our empty wallets and onto a future rich in opportunity. Support Michael’s work. Note: If you get a note saying “Temporarily out of stock,” it simply means that the print-on-demand is not printed yet. However, you can buy it on the Amazon shopping cart, to be sent soon. Thankyou for your support.